Double Baby Stroller Types - Which One Is Right For You? You’re pregnant with twins or with baby number 2 on the way and now you’ve got to consider how to get around with two children. Double strollers are essential, but now you have to think about what type of stroller to buy. Just like purchasing a single stroller, there are lots of options you must consider. It used to be that double strollers were huge, cumbersome contraptions limiting where you could go. Trips down the grocery aisle caused traffic jams, walking down the sidewalk took up the entire width and forget about going through open doorways. Today a double baby stroller has far better quality: lighter, less bulky, more compact and easier to maneuver. You’re going to be impressed as you see the variety on the market today. From high-end beautiful products with fashionable colors to budget-friendly functional buggies that get the job done, there is a double stroller for every family. Choose your double baby stroller now, or keep reading if you’re unsure. There are more choices than ever when it comes time to select the right double baby stroller for your family. Side-by-side, tandem, umbrella, jogging, and all terrain stroller types have unique features that fit different family lifestyles. Some are better for children of different ages and others are good if you have a twin pregnancy and need a stroller for two newborns. By the time you read through this page, you will have a better understanding of these strollers along with some recommendations of best-reviewed brands for each kind. Side-by-side or twin strollers are made with two seats next to each other. This type of double baby stroller used to be too wide to go through doorways or store aisles, but most well-made twin strollers are narrower. If you have twin babies and need a stroller that fits two car seats, take a look at this selection of the best strollers for twins. Side-by-side strollers offer the same arm and leg room for both children. They can easily see each other and talk. They can also see their surroundings better, and both children are within an arm’s reach from Mommy. 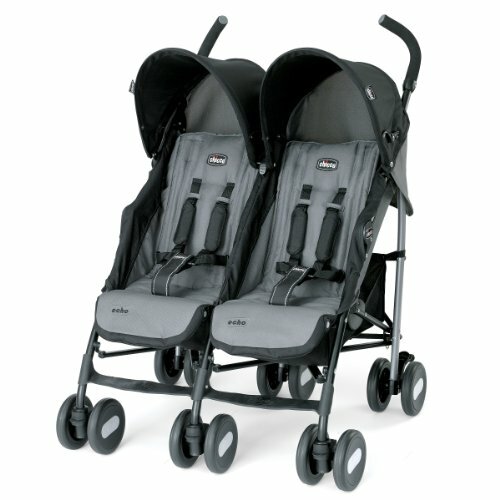 Side-by-side strollers are a great buy if you have twins. Owing to how wide they are, however, they may be more suited for use in the suburbs or in the country—that is, places where you’ll least likely be bothered by narrow doorways and tiny elevators. They give each of your passengers a better view of the world. One edge a side-by-side stroller has over an inline or tandem stroller is that, with both occupants facing the same way, they each get to appreciate the same view. With older toddlers, that means no fighting over which one gets the better seat. will be cramped for legroom. Each seat can also be reclined independently. Some side-by-side strollers even have a divider installed between the seats, making your children feel as if they each have a stroller of their own (no fighting!). You also get two snack trays. They’re easier to push and steer. While side-by-side strollers are wide, they’re easier to maneuver over uneven surfaces than tandem strollers. PRO TIP: For even better maneuverability, get an all-terrain side-by-side stroller. Their seats offer the same weight limits—and a higher combined weight limit. Each seat in a side-by-side stroller has the same weight limit (unlike tandem strollers that often come with different weight limits per seat). An added bonus is that side-by-sides usually come with a higher (usually combined) weight limit. This means you can use your stroller for longer. They fold easily. While this is a matter of taste, most owners of side-by-side strollers love how they easily fold in half horizontally, (usually) with just the pull of a strap. On the other hand, there are a couple of reasons you may want to look at other options besides side-by-side strollers. They’re hard to get through narrow passageways and aisles. This is the most common complaint owners of side-by-side strollers have. Maneuvering it through small, crowded stores can be tricky, as is getting it through doorways. Most side-by-side strollers are between 29 and 32 inches wide, while many interior doorways measure 32 inches or less. 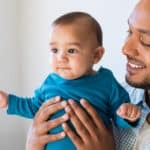 In such cases, parents will have to either carefully shimmy their strollers at an angle, or take out the occupants and fold the stroller to get through. They often pull to one side when weight distribution is uneven. If you’ve got kids that have a relatively wide age gap—for instance, a newborn and a toddler—you might want to use a tandem stroller instead. Most parents report that side-by-side strollers tend to swerve to the heavier side when occupied by kids with different weights. Side-by-side double baby strollers should also have the option of attaching at least one infant car seat to it; very few have double car seat capacity. 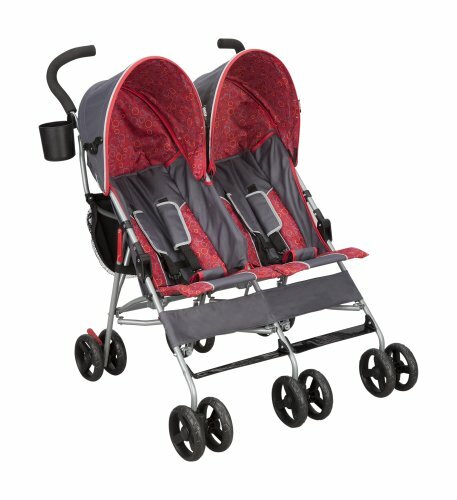 A twin stroller usually has a side-by-side design so that both seats can be fully reclined. 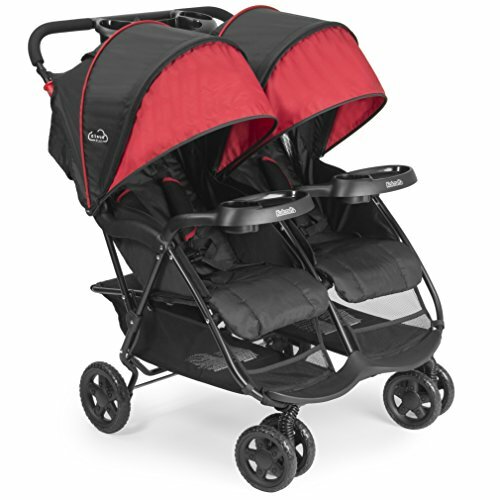 Discover the best side-by-side/twin strollers by clicking the link right below the photo. Note that parents with twins also like tandem strollers. A tandem double baby stroller has two seats, one behind the other. The back seat can be reclined fully, but the front seat usually cannot be reclined all the way. Therefore, such a tandem stroller is ideal for an infant and a toddler, where the toddler sits in front, and the younger sibling lies or sits at the back seat. But many families do like a tandem for their twins as many models these days can take two infant car seats as a double travel system. Have a two-month-old and a two-year-old? Then a tandem stroller may be a better option. If you’re not too keen on side-by-side strollers because of their width, here are a couple of other reasons why tandem strollers are a good buy. They fit right about everywhere a single stroller can. The average width of a tandem stroller is 21½ inches—more or less the same width as a single stroller—which makes it easier to navigate through narrow spaces (like in the doctor’s office or grocery aisles). They can be used from birth (using car seats or bassinets). Tandem strollers are arranged either staggered (stadium-style) or with one seat in front of the other. Either way, they can usually be configured to load one or two infant car seats with no problem. They allow for multiple seating options. Some tandem strollers allow you to arrange the seat a variety of ways, which is great if you’re dealing with growing infants. 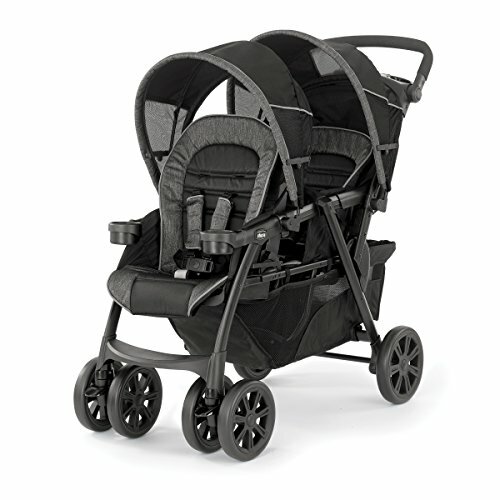 For instance, the Baby Jogger City Select allows for more than 16 seat configurations. But of course, along with the good, comes the not-so-good. Just like side-by-side strollers, tandem strollers also have their fair share of drawbacks. Scroll down below for some reasons most parents prefer side-by-sides over tandems. They’re more difficult to steer. Where side-by-side strollers are wide, majority of tandem strollers are long. This makes steering them over curbs and edges tricky. Another thing worth noting: most parents complain that some tandem strollers become more difficult to push when a second child is occupying the bottom seat. That said, you really have to be “literally” hands-on when pushing around a tandem stroller. They might not fit smaller car trunks. Because of their length, some tandem strollers will not fit the trunk of subcompacts, which might not make them the ideal choice if you’re traveling. Another usual complaint against tandem strollers is that they’re cumbersome to fold. With some models, you will have to remove both seats first before you can fold the stroller. They don’t offer the same view. While some tandem strollers are a marvel of space-saving design, the usual downside of this is that one of your kids will have to take the seat with the less favorable view; not a problem if you’re bringing a toddler and an infant, but older, more opinionated kids might think otherwise. If you’re going to use your tandem stroller with a car seat, for instance, you’re most likely going to have to place your infant in front, which means lesser space for an older child at the back. Most parents also feel that tandem strollers place their child too far in front. Also, some tandem strollers come with a smaller “rumble” seat at the back, which has an equally lower weight limit. This might pose a problem when one or both of your kids grow taller and larger. A tandem stroller has a narrow width, which allows access through doors and tight spaces. Maneuvering a tandem stroller through crowds should be easier than a side by side since you’re going in single file, taking up less space. But turning corners is more difficult with all that stroller and weight sticking out in front. Explore the best tandem strollers by clicking the link below the photo on the right. You will be amazed at all the choices from simple tandem styles to models with all the luxury features. From stadium seating to removable, reversible seats, you’ll be sure to find the right double tandem for your family. All terrain strollers, also known as sport strollers or sport utility strollers, are ideal for parents who are not necessarily into jogging, but prefer to take long walks or hikes off-road or on the pavement. However, many models are perfectly suited for jogging as well. 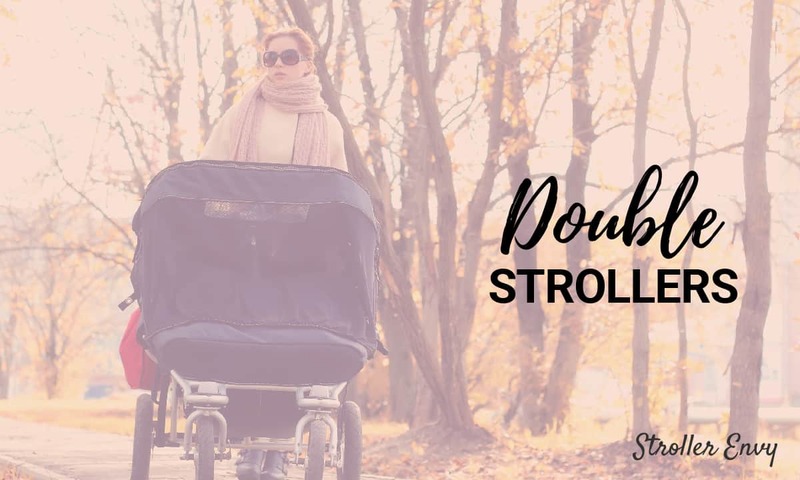 All-terrain double strollers have three wheels with a front swivel wheel that has the option to lock straight for better stability over different types of surfaces, especially when jogging. 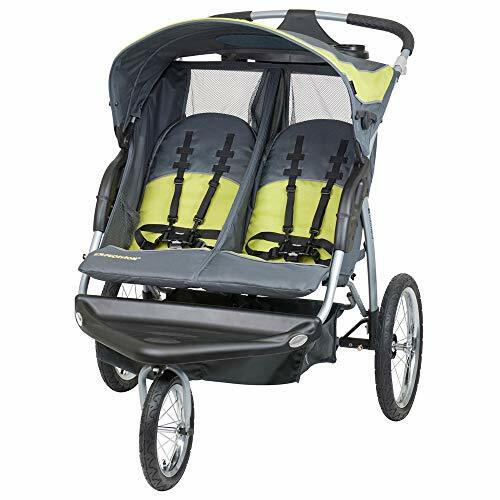 Most all-terrain double baby strollers can accommodate an infant car seat with the addition of an adapter accessory, however, jogging is not recommended with any all-terrain stroller when it is being used as a travel system. Many of these strollers will only accommodate one infant car seat, not two, so an all-terrain is not the best idea for twins until they grow bigger. Find out more about top-of-the-line brands like Bumbleride, BOB or Phil & Teds to more budget-friendly styles like InStep or Baby Trend by clicking beneath the photo above. 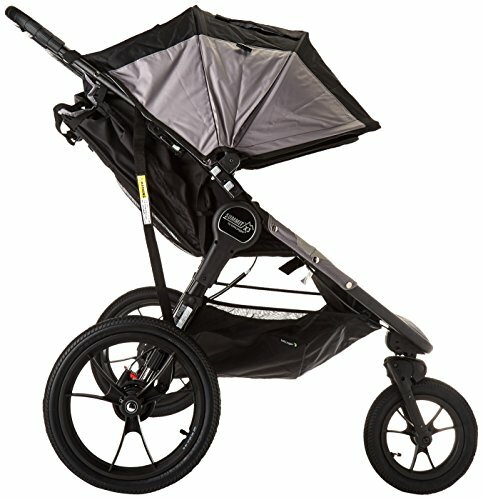 Searching for a reliable double all-terrain stroller that you can use from birth until your kids are 3 or 4 years? We recommend the 2018/2019 Bumbleride Indie Twin. Infant ready, lie-flat seats with adjustable canopies, backrests, footrests and bassinet mode fabric panels, perfect for newborns. Can accommodate twins. 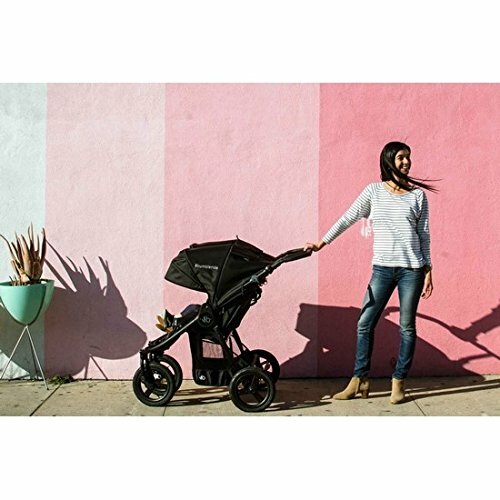 Few side-by-side strollers offer the option to carry two car seats or carrycots, and the Bumbleride Indie Twin is one of them. Besides being travel-system ready, the Indie Twin is also ready for use with your newborn, as the seats recline nearly flat. The Indie Twin promises a sleek, stable ride across most terrain (sand, gravel, and grass), thanks to its all-wheel suspension and large, 12&quot; air-filled tires (a pump comes with your purchase). The Indie Twin measures 29.5 inches wide, so it fits most standard doors, albeit with some effort. Opening and foldup is a breeze, thanks to its one-step standing fold (with auto lock) and redesigned and now more user-friendly fold levers, located on the handlebar. Speaking of the handlebars, this most recent edition of the Indie Twin now comes with a comfier and adjustable TPR (thermoplastic rubber) grip. Parents will be delighted to know that the Indie Twin has more than enough storage space at the bottom. Even better, Bumbleride purposely designed the storage basket to be readily accessible: none of that annoying bar running down the middle, so you’re free to store your diaper and grocery bags below. Features-wise, the Indie Twin shares similar traits with the Mountain Buggy Duet. However, what ultimately won us over to the Indie Twin’s side is the fact that its fabric (both inner and outer) is made from 100% recycled PET (from water bottles), making it the eco-friendlier option. As for the price, expect to spend a few hundred dollars more on this premium number: it currently retails at $768. Then again, the fact that you can use this from birth up until your kids are 3 or 4 (5 even) makes it a worthwhile investment. Sit and stand strollers are the answer parents have been waiting for when they have a baby who needs a stroller and a toddler who can walk and doesn’t like to be strapped down in a stroller. Your older child likes the independence of being able to get in and out, and standing and riding when you need to get on your way. Yet when your child needs a rest, a simple padded bench is provided next to the platform. A sit and stand is usually smaller and more compact than a regular tandem stroller, and it is typically easier to maneuver and store. When the standing area is unoccupied, it can be used as a storage area and this makes a Sit and Stand stroller popular among parents with only one child. Learn more about the top brands that offer a sit and stand stroller, the innovative stroller and a half. Let’s admit it: sit and stand strollers are not the most fashionable to push around, but then you’ll only get to appreciate how much of a necessity they are when you’ve got both a baby and a whiny older (but still small-ish) kid—who refuses to walk a step further—in tow. It was a tough call, but ultimately I chose the JOOVY Caboose Ultralight. 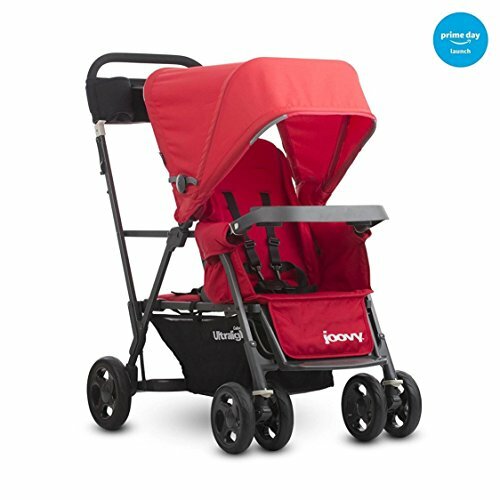 Baby Trend may have invented the “sit and stand” stroller, but it’s JOOVY that really carried this category up a notch with its line of smooth-riding sit and stand strollers. 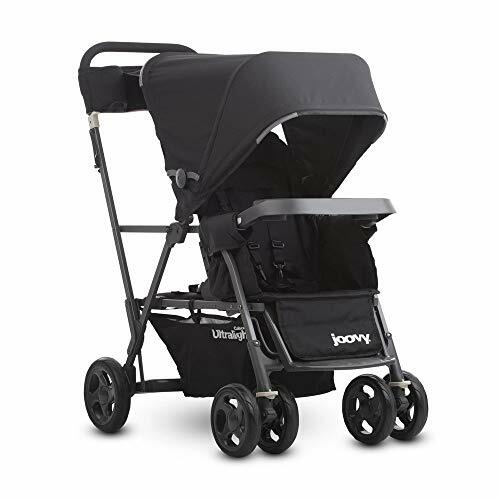 In a nutshell, we picked the JOOVY Caboose Ultralight Graphite because it’s lightweight, easy to maneuver, and it’s a hit with toddlers (and their little siblings too). The Caboose Ultralight Graphite is nimble and lightweight. It’s like a single stroller in more ways than one, starting with the lightweight frame. At 22 pounds (snack tray included), it truly lives up to its “ultralight” name. It used to be that sit and stand strollers suffered from the weight of carrying two kids (with one significantly heavier) in terms of handling. 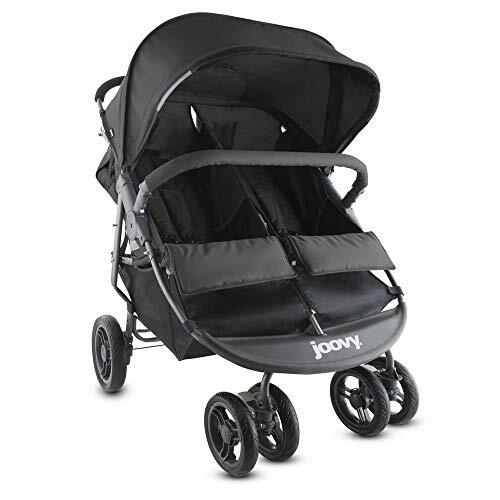 But we had no such experience with the JOOVY Caboose Ultralight Graphite. In fact, the all-wheel suspension ensures a smooth, seamless push across almost all surfaces. Other thoughtful touches include a canopy that shields both occupants from the sun, a snack tray in front, and a parent organizer that comes with two cup holders and a zippered pocket for your keys, wallet, and phone. As for the downside, the folding mechanism does require a bit of a learning curve (you’ll have to position the stroller correctly before getting it to fold properly), but once you get the hang of it, it’ll be like second nature to you. Take note of its folded dimensions too: 10.5″ (H) x 21.5″ (W) x 41.5″ (L). Have a small trunk? You can reduce the length to 37″; if you take out the snack tray and canopy prior to folding. Also, the storage basket, while spacious and roomy enough, is hard to reach if you have the toddler bench in place. Accessing the basket would mean letting off your toddler each time you need to get or place something in it. You can read our complete review of the JOOVY Caboose Ultralight Graphite here. Of course the other two are great choices nevertheless. It really all depends on your needs. If you’ve got two older kids, for instance (let’s say a 2-year-old and a 4-year-old), the Baby Trend Sit N Stand Ultra will suit them just fine. If your kids are wider apart in age (say, an infant and a three-year-old), the Graco Ready2Grow would make a fine choice as well. Umbrella strollers get their name from the curved double handles; they also fold up very easily, just like an umbrella. Umbrella strollers are the lightest, smallest, and simplest strollers in the market. Umbrella strollers have cloth or vinyl seats on a basic frame, with limited features such as a sunshade and storage basket. The double versions generally weigh between just over 20 pounds up to 32 pounds at the heaviest. This type of double baby stroller is popular with parents who take trips on airplanes because they are easy to gate-check. Families who enjoy going to huge amusement parks such as Disneyland also find the umbrella double stroller a very convenient way to go. However, umbrella strollers are designed for infants that are at least 6 months old who can sit in an upright position. They are not suitable for newborn babies because this type of stroller usually does not recline flat, although some models can. 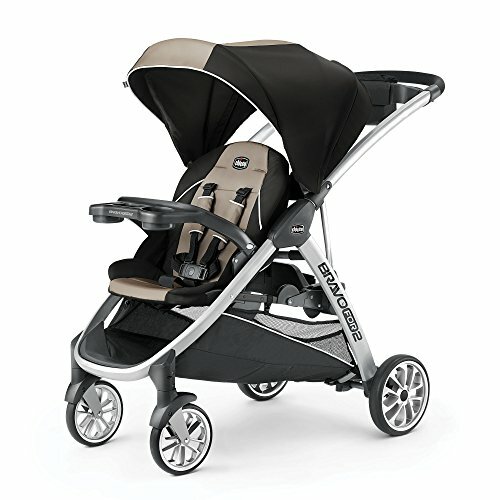 Discover more about different brands and models of highly-rated double umbrella strollers from Maclaren to Chicco. A few reasons why we love umbrella strollers: they’re light, they fold easily, and they’re affordable. That said, they make a perfect backup to keep in your car, for those quick and unplanned trips with your little ones. While we would advise that you invest in a good quality main stroller, don’t break the bank buying an umbrella double stroller. A reliable but inexpensive choice is the Delta Children City Street LX Side by Side Umbrella Stroller. Retailing less than $70, the City Street LX Side by Side Umbrella Stroller is a budget-friendly option if you’re not looking for anything fancy and just need a lightweight stroller for travel. Let’s look at features you’ll love. The City Street LX weighs only 21.4 pounds, and it can carry a maximum weight of up to 35 pounds each seat. It measures 29.6 inches across, and will fit through most standard doors. As for the seats, it has a multi-position recline (with each seat able to recline independently), and comes with a 5-point safety harness and soft padded shoulder straps. Safety-wise, the City Street LX Side by Side was designed to conform to several safety standards, including ASTM (American Society for Testing Materials) and CPSC (Consumer Product Safety Commission). It’s certified by the JPMA (Juvenile Products Manufacturers Association) too. On the downside, the canopies could be bigger (but we weren’t really expecting much, knowing that this is a compact stroller), and the absence of a storage basket could be a deal-breaker for some. Thankfully though, Delta Children was thoughtful enough to compensate by adding several other storage options: namely a cup holder on one side of the handlebar and mesh pouches that can store your kids’ snacks. Overall, this is a sturdy and reliable double umbrella stroller that delivers so much more for its price. 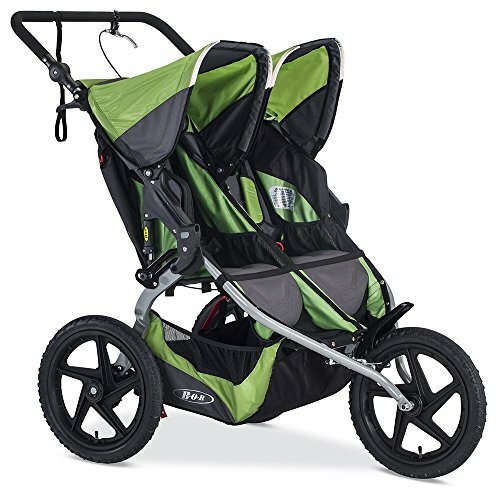 Double jogging strollers are excellent for active families. They are usually made with three large bicycle-style racing wheels, and they are very sturdy to withstand the vibrations of a faster speed. Jogging strollers are also good not only for jogging but also for walking on rough terrains or uneven surfaces. However, they have a fixed front wheel, so they aren’t that convenient for maneuvering; consider an all-terrain double baby stroller for more maneuverability. Jogging strollers have rear or all-wheel suspension systems, which make it easier for joggers to maneuver it smoothly on uneven roads. Double jogging strollers also come with hand brakes, which are a wonderful safety feature. 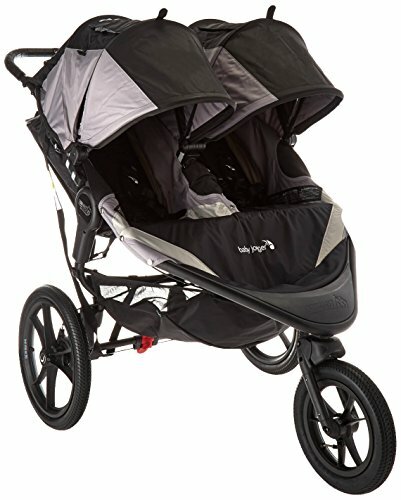 Most double jogging strollers have similar features just like their regular double stroller counterparts. 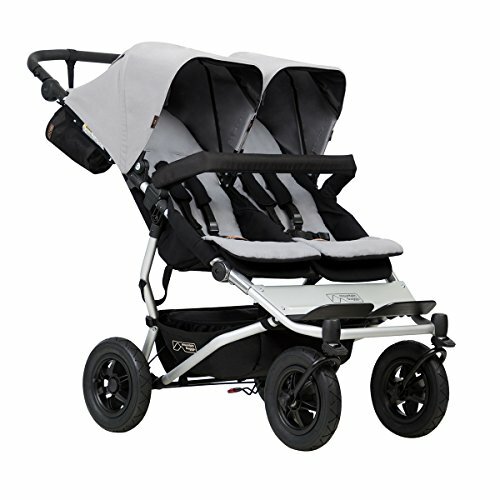 Explore the different double jogging strollers on the market today from top brands like Baby Jogger and BOB to InStep. Parents who like to stay fit whilst taking their little ones along deserve an award for multitasking and being so productive. And they deserve a trusty sidekick to help them accomplish just that too. 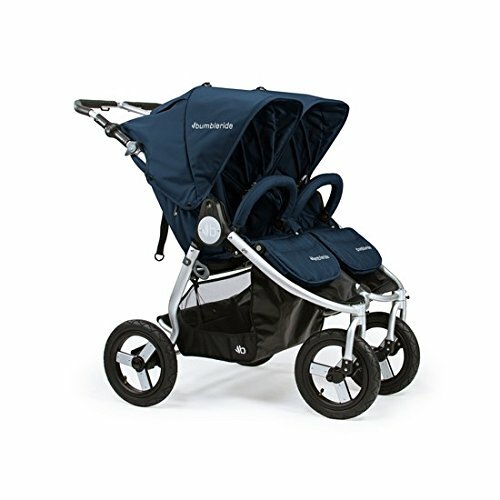 Enter our top pick for double jogging stroller, the 2016 Baby Jogger X3 Summit. The Baby Jogger X3 Summit keeps up with your active lifestyle with durable all-terrain inflatable tires that measure 12″ in front and 16″ at the back. The all-wheel suspension ensures a comfortable ride for your young passengers across road bumps and uneven surfaces. Additionally, controls for rear brakes and front-wheel lock are within easy reach on the handlebar. Furthermore, a large weight capacity and tall seat back ensure that you can use the Summit X3 with your kids for years. The seat back height reaches 23&quot;, while each seat accommodates a child up to 50 pounds. It has a wide legroom and deeper seats too, making sure your kids won’t outgrow them anytime soon. The canopies on the Summit X3 are something to behold too. They’re extra large and provide UV 50+ sun protection. The sturdy and well-built canopy, coupled with the thick protective fabric, will definitely put you at ease, knowing your little ones will be safe against the sun while you go about your business. It weighs 37 pounds, so it’s definitely not lightweight. However, it does fold down easily and is a breeze to get in and out of your car, thanks to Baby Jogger’s one-step pull-to-fold strap. On another positive note, once you’ve got it on the ground, weight becomes a non-issue as the excellent maneuverability on the Summit X3 will make you feel you’re pushing a lightweight stroller. Another good thing about the Summit X3 is the large storage basket, which can hold plenty of essentials (a parent has stuffed it with a backpack, two small cooler bags, two kids’ towels, plus a couple of other items, just to give you an idea how spacious it is). 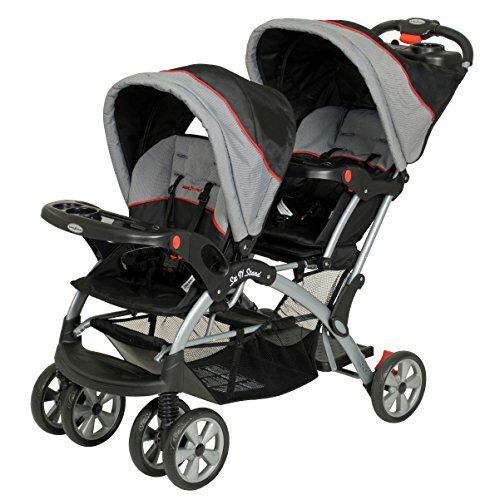 Price-wise, the Baby Jogger X3 Summit Double Stroller will set you back $599. A bit steep (but still cheaper than the BOB Revolution Flex Duallie by about $40), but with its sturdy build and ease of use, we daresay it’ll pay off with the many years it will serve you. It’s a blessing and a joy having more than one child. And part of the fun is getting to pick the very best gear for your little ones—and “best” doesn’t always mean the most expensive. When choosing a double stroller, it’s best to consider what (and where) you’re primarily going to use it for as well as how much money you’re willing to part with for one. Along with that, make sure to do some investigative work on the best brands for the type of stroller you’re eyeing. We hope you’ve found the information in this article useful. Have a stroller in mind that you’d want us to feature? Let us know by commenting below!